Date estimated. It used to list attractive features about living in Orkney in the the job application pack that you got from the OIC, one of which was '...and Kirkwall probably has the best Woolworths around' or something like that. I'll get the exact wording. But it is a pretty good Woolies. Whatever happened to the scales? I fondly remember stopping to weigh myself when I would take the dog for a walk with my dad on a Sunday morning. One of the three places I used to go with pocket money: Leonards, Woolworths and Spences. How many of those still exist? What was on Woolies site before? Xmas day discussion. Was this the site of the old kirkwall cinema? Before Woolworth's this was the offices of Drever & Heddle, Solicitors and before that, from 1856 or a few years afterwards till his death in 1884, P. S. Heddle, Solicitor and Town Clerk. He started the first Kirkwall branch of the Bank of Scotland in the building some time in the 1860s and it was there till it moved across the street to where the Alliance and Leicester is. Before Heddle's time this was the town house of the Shapinsay Balfours. It and the Custom House were all one property with a large garden behind. At some time before that according to Hossack the house, or an earlier one on the same site, was known as "Hell". The Solicitors Drever & Heddle used to have offices in the building on the Albert Street side of the site where Woolworths was situated. 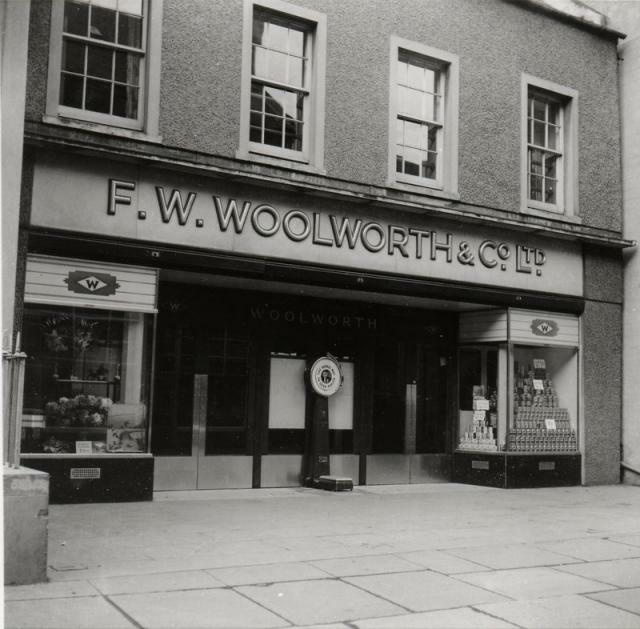 Where the front of Woolworths is set back from the street used to be a small enclosed courtyard with a stone wall along the street edge topped with railings. I used to park my bike there when I worked with Drever & Heddle as an office boy for a short time in 1943. We had a happy staff, John Oddie, Ada Gunn, Rene Garrioch and Miss Maitland. William Davie was the solicitor with William John Heddle more less a sleeping partner and Town Clerk. He lived in Daisybank where I had to go regularly to get documents signed. He was also joint manager of the Bank of Scotland with James (Ian) Bruce. Major Bruce was commanding officer of the 1st Batt Orkney Home Guard which he allowed me to join (under age) as a runner, I didn't get a rifle until I was 17 but I was allowed to fire on the range. Six months later I was in the RAF. I Cant belive that they are turning this iconic Orkney leg of Woolworths into a mountaineering store, there's no mountains up here!! It, again, is aimed at the tourist trade *rolls eyes*. What about the people who live here all year round? Its rediculous. well Woolworths aint coming back, so its probably better than an empty shop.. I agree with N.Muir`s sentiments it is not the future we were hoping for when Woolies closed. My 37 year old son remembers spending his holiday money in Leonard's then walking up to Woolworths to stand on the scales before going in to spend the left overs at the sweetie counter just inside the door. I had a holiday job there for several consecutive years in the mid sixties and it was a brilliant place to work. I was given an arithmetic test before getting the job and remember sitting upstairs in the staffroom, right hand window , calculating bills in Pounds,Shillings and Pennies. No calculators in those days. What/who was the shapinsay Balfours? (I work in the current store) have been told it is haunted/has a spirit in there?